Everybody will love this Paper Plate Cookie Monster. 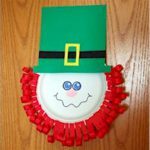 The kids will smile from ear to ear as they make this fun craft. As a bonus there is an easy option to turning this into a hand puppet. From two of the small paper plates, cut the center smooth part from the center of the plate. Paint black eyeballs in the center. Cut the other small paper plate in half. Discard one half and paint the other half black. Paint the large paper plate blue. Once all of the pieces are dry, assemble using the photo as a guide. the bottom for a child's hand. Making Learning Fun: An early childhood education website filled with free printables designed to do just that, make learning fun! Whether you are a parent, teacher, or childcare care provider, you'll love our site filled with educational printables and activities for the children you love. You'll find that pre-kindergarten through second grade students will enjoy our activities most, but you'll find yourself having fun too!